I know, I know. Workbox of the Week is hit or miss lately. Illness at our house has taken a toll on the education of the youngest members of this house. This week Margaret completed a boxed craft project. It was a Disney Princess puzzle that she received for her birthday. The actual puzzle did not color well, it was intended to be a color and wipe type of activity. Well, that drove Margaret crazy, so I photocopied the puzzle so that she could color it to keep. It got me thinking that you could do a puzzle out of any coloring sheet. Just make sure the pieces you cut are sized appropriately for the age of your child. 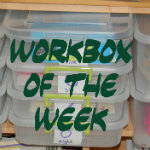 Check out my other Workbox Ideas here!